The process of creating a custom decorated T-shirt from our online design tool is easy. The hard part is creating a clever design that will advertise your business or cause. The process is easy! But how do you ensure the design you are putting together will effectively market your business or cause? Here’s are five tips on how to create custom t shirts and hoodies that market your business or cause. 1. Think about the purpose of the T-shirts and hoodies. Do you want to create custom t shirts and hoodies for your buddies, your business, or both? Let’s says you own a brewery and you want your staff to wear custom T-shirts that make them standout from your customers AND remember the name of your brewery. It would also be nice if your custom T-shirt design is cool enough that your customers and your friends would also like to have one to wear. So, you’ll probably want at least two different color shirts, one for your staff, and one for everyone else that loves what you do. You’ll also want a design that says something about your particular brewery, like where your brewery is located, or what your number one beer is called, or something like that. 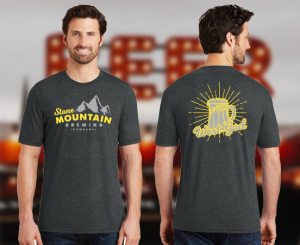 So, if your brewery is called Stone Mountain Brewing Company, you might want your shirt to have a cool mountain image, plus your company name in a big bold font that is easy to read and complements a mountain image. On the back of your t-shirt, consider adding a beer mug with the name of your stop-selling brew below it. On the sleeve you can add your address. 2. Now imagine the design on a T shirt. When you create custom t shirts and hoodies for a business or cause, consider your T-shirt design as an excellent and cheap marketing tool. Every time your shirt gets worn into Walmart or a movie theater, there’s a chance people will notice your company name. So, make sure what you’ve put on the shirt is easy to read and decipher from several feet away. If so, score 1 point for your design. Is the design attractive enough that other people will want to wear it? Score 10 for your design. 3. Simple can be beautiful. Easy-to-read letters and a design that a customer can easily doodle are good checkpoints for your design. Also keep in mind that the fewer colors you use in your design, the cheaper the screen-printing cost. So, if you can show what you need to show in one color and half tones of the same color go for it. 4. Check out the free t-shirt design tool templates. Browse multiple categories of templates. In “outdoor” for example, you’ll find mountains and pines trees and sunshine, all things that may work with your brand. Check out all the font options, too. Maybe all you really need is name of your brewery in a memorable font along with the skyline of your city uploaded from a photo. To spark your creativity, you can also Google shirt designs made by other breweries. Don’t copy their design (it may be copyrighted! ), but use the other designs inspiration on how to make your design even better. 5. Share your completed design with our on-staff professionals. Our staff designers are happy to make sure your custom t-shirt design will print as beautifully as possible and that it is perfectly centered on the shirt. At Broken Arrow, human art services are also FREE.